What is the Waterway Protector Spotlight? The Waterway Protector Spotlight is a way for us to recognize people who are going above and beyond to protect our waterways. The people we recognize can be anyone from government employees advocating for safer waterway practices to community members making a difference in their neighborhoods. Send your nominations for the Waterway Protector Spotlight to protectwiwaterways@gmail.com or through social media! 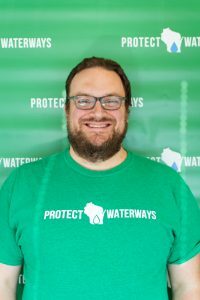 Wes is the Sustainability Coordinator at UW-Whitewater and was the first person to be hired for the position at the university. He has held the role for 10 years and is an alumnus of UW-W with two Bachelor’s degrees. He manages around two dozen active projects with a special emphasis on campus sustainability through institutional operations, campus and community engagement, and classroom involvement, improving energy and water efficiency, maintaining the campus garden, and Earth Day events! To #protectwiwaterways, Wes is involved with the Rock River Coalition Water Action Volunteers Program. This program monitors Bluff Creek, Spring Brook Creek, and Whitewater Creek for stream health. They also conduct periodic stream cleanups focused on removing trash from Whitewater Creek.